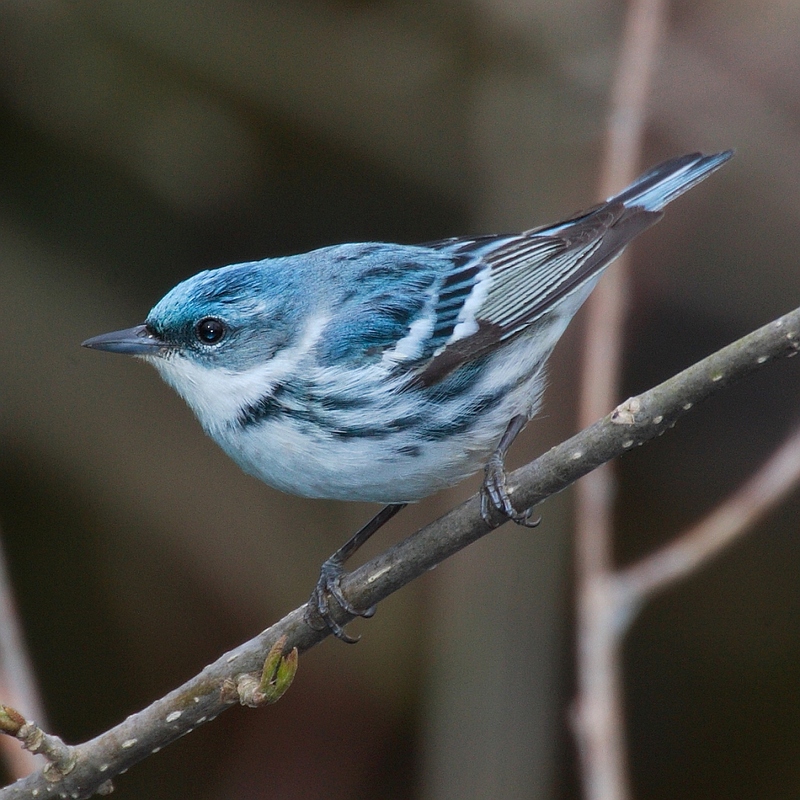 A male Cerulean Warbler was first reported over the Gill yesterday (April 22), but very few people saw it and it was not known to be re-found after its initial sighting. The bird was seen again early this morning and alerts immediately went out, allowing over sixty birders to see it during its extended stay in the trees northwest of Bow Bridge at the southern edge of the Ramble. Though I went out to view it mid-morning, I got much better views when it appeared over the Oven at 6:25 p.m. with the setting sun illuminating it. Spectacular! I wrote about the Cerulean Warbler extensively in my book. Not only is it one of the six rarest regularly-occurring warblers in the area, it was also Starr Saphir’s favorite bird, and one that inspired her color choice in outerwear. So seeing it brings back memories of her. I had just finished viewing another Wilson’s Snipe found at Turtle Pond, along with a Spotted Sandpiper, the first-of-season for me. I also had my first-of-season Prairie Warbler earlier in the day. So it was a good birding day, even though migration has so far been hugely disappointing, even worse than last year, which was the worst year veteran birders could remember. Yesterday, April 10, a Wilson’s Snipe was reported at the Point in the Central Park Ramble just after 7 a.m. I was immediately faced with a question that I knew would come up often throughout the 2014 spring migration season: do I chase this bird? I am not trying to do a big year in 2014, at least not with anywhere near the level of effort that went into my 2012 big year, and probably not even with the much-reduced effort level of 2013 when I observed 199 species. Still, I enjoy the challenge of birding and I like to observe rare birds. I did a great job again at winter birding, so my total species for the year places me among top few (now second place, 101 species) on the eBird New York County “Top Birders” list, not far from the overall lead. It was a pleasant morning and I can run to the Point in under ten minutes, so I decided to chase the snipe. I got it, but only after a short delay when I first checked the shore of the Point that faces the Boat House. Wilson’s Snipe figured in my 2012 big year — one appeared at the Upper Lobe and I had to choose between chasing it or chasing a much more distant Yellow-throated Warbler in the limited time I had before a lunch date. I chose to get the snipe, and I ended up getting the Yellow-throated Warbler with Starr a couple weeks later. Wilson’s Snipe is a very good bird for Central Park, one that gets reported roughly once per year. One also appeared in 2013 in nearly exactly the same place on the Point. When the “do I chase this bird?” question arises next time, I am more inclined to say no — unless it is a life bird. I want to get my securities trading business going, and this requires beginning work by 8 a.m. or so. I probably will make exceptions for some of the best migration mornings. Or I might go out very early, at first light, which is already 6:30 a.m. and will be 6:00 a.m. in a few weeks. This can be a very productive time to bird, when the city is quieter and the parks are mostly empty. I went out at 7:15 a.m. today, April 11, for what promised to be an excellent morning, one followed by a day and night of moderate south-southwest winds. It was disappointing. There clearly was a huge flight of Northern Flickers, which could be seen everywhere, both in the air and on the ground. I saw at least 50. Many Ruby-crowned Kinglets arrived, too. Just two days ago I was delighted to see a single one, my first of the season. Today I saw at least 15, and they finally outnumbered the Golden-crowned Kinglets. I added three new species for the year: Palm Warbler, Field Sparrow, and Blue-gray Gnatcatcher. But I observed no other warblers, not even Yellow-rumped (which I had seen a few days ago), nor did I have any Blue-headed Vireos. I did reach the 100-bird milestone for the year (101), and so for the sake of comparison I looked back at the prior two years. As of April 11 in 2012 I had 94 birds; in 2013, 98. Of course, spring migration in New York was a disaster last year. All these numbers show is that I have had successively better winters. We will see what happens with the 60+ species that are slated to arrive over the next six weeks. The Common Raven has been one of my nemesis birds for over two years now. Until recently, it was extremely rare in the New York City area, with no eBird records (even historical ones) prior to 2010 in Manhattan, and only a few in other parts of the city. Since 2011 it has appeared occasionally in many parts of Manhattan, including Central Park. It has perched on an Upper West Side movie theater, one of the Reservoir pump houses, and the Fort Tryon Park Café. It is no surprise that ravens should sometimes wander into Manhattan. They are seen regularly in New Jersey over the Palisades and the Meadowlands. They also nest just north of Manhattan and are often occur in Pelham Bay Park. Ravens have taunted me with nearby appearances. Starr Saphir had one over the Pool just ten minutes before I was planning to meet her in April 2012. More recently, one appeared in January on Randall’s Island the same day I observed the Snowy Owl, and then for a couple mornings after that. Throughout all these years, there has remained one constant: you have never seen me and a Common Raven in the same place at the same time. The bird has proved superbly skilled at avoiding me — until today. Over the past week there have been eBird reports on several days of a single Common Raven observed after 4 p.m. in the area near Chelsea Park in Manhattan’s Chelsea neighborhood. Ravens can range widely, and I was not inclined at first to make a long trip to a place where a raven was the day before hoping it will appear there again. But once the second report came in, from the same spot as the first, I knew the odds were high that the raven would return. It sounded as if it could be nesting there. I arrived at 23rd Street and the High Line at 4 p.m. today, and I walked the High Line north, searching the skies. I figured that the raised track would offer a good vantage point, but after a half-hour of looking I still had not seen any ravens. So I decided to walk closer to where the raven had been seen flying, over 8th Avenue and 26th Street. As soon as I got there, I heard and saw the raven. It was flying between the 8th Avenue corner of 26th Street and a water tower atop a building on the 9th Avenue corner, and calling loudly. What’s more, perching on the water tower was another Common Raven. So perhaps Manhattan will have its first nesting pair of Common Ravens? We shall see. At any rate, I added my 238th lifetime Manhattan species and my 88th of 2014.